A product I am definitely far too lazy for to remember to put on is usually primer. As someone with dry skin I always remember to prep my skin with moisturiser but a lot of the time primer is something I tend to give a miss on an everyday basis unless I'm going out after work and need my makeup to stay better put throughout the day or I'm going out out on the weekend. So when I do manage to actively remember to put on a primer it's usually on of these three which I use for all very different reasons. When I'm having a bit of an oily and bad skin day which is currently right now the NYX Pore Filler Primer* is a great drugstore primer that makes your skin a clear and even canvas to apply makeup onto. I tend to have quite big pores on my cheeks and if I'm going for a heavier matte foundation for a night-out this definitely reduces the size of them. I do get quite confused when a primer says to use it alone trust me if I'm having a no makeup day, that means NO makeup at all so I've never used this alone, but if you're someone who needs a product that just adds a flawless complexion I definitely would recommend. On a night-out I usually want a bit more of a glowy complexion so the Charlotte Tilbury Wonder Glow* is the first thing I grab. I wouldn't necessarily say this is one of those primers that makes your makeup last any longer, but instead is just adds to your complexion. Sometimes I find with glow enhancing primers they usually have flecks of glitter in them not what I want on my face whereas this just provides a champagne/golden sheen to your base. I've found that it works with most foundations whether matte or dewy and doesn't make my makeup slip underneath it either. A relatively new product in my collection is the Revlon Photoready Protecting Primer. * which when I looked at it I was mildly concerned it had this white undertone to it so would wash me out, but instead have found that it reduces redness. If you're someone who doesn't like a silicone based primer, but still wants that soft and smooth feeling this is such a great find. I actually find it quite hydrating as well for my dry skin but without feeling greasy too. Let me know in the comments below what one of your favourite primers is and how you make sure to incorporate it into your daily routine! Thanks for sharing these, been on the lookout for a new primer to try! The NYX primer is one that I've been meaning to try for so long. I either go for awhile without any primer whatsoever (terrible, I know), or I stick to Baby Skin by Maybelline. Definitely want to branch out & try a few! The NYX primer sounds really good, I'm currently using a primer from ELF and loving it! Oh I love the CT one! I love Wonder Glow, it is such a stunning primer! 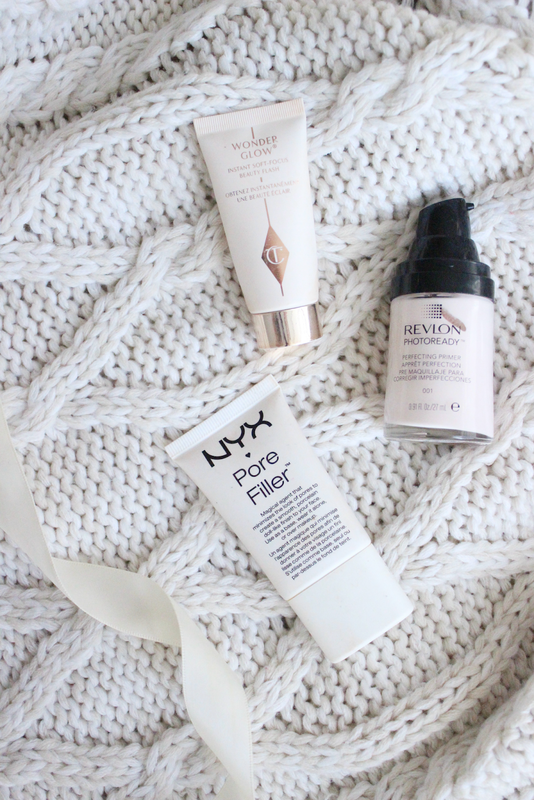 the Pore Filler sounds really good!